The best, and one of the very rare good, parts of “Kingsman: The Secret Service” are shown in the trailer with Colin Firth showing off his James Bond moves taking down 6 street thugs. The movie is not funny enough to be a comedy though it tries, certainly not enough satire to be a comic version of James Bond or Jason Bourne, with both being referred to as are old movies and so is “My Fair Lady” regarding the transformation of street thug Taron Egerton to a Saville Row gentleman. There is an unrecognizable Mark Hamlin who provides an unsaid reference to “Star Wars”. By the way, does Samuel L. Jackson serving a big Mac remind you of still another movie? The body count in “Kingman: The Secret Service” totals more than the last 10 thrillers you may have seen and so many are not only gratuitous but graphic, such as a guy being sliced in half vertically. From Firth taking down the 4 thugs he will eventually take down 50 or more people by himself in a church that is one of the worst vulgar speaking scenes I can ever recall in a movie. Jackson as the villain who gets sick at the sight of blood, Sofia Boutella as his henchwoman who wears blade feet prosthetics to slice people up, Michael Caine as head of the Kingman’s organization, Samantha Womack as Egerton’s mother who is abused by her boyfriend, Geoff Bell--remember this is suppose to be a comedy and/or a take off of comics--with Jackson showing any sort of camp villainy the only one who seems to be having fun. 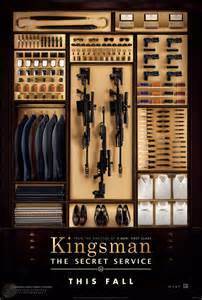 Taron Egerton makes an impressive debut, along with providing some eye candy, and Colin Firth is an impeccable pseudo James Bond while Sophie Cookson as a rival recruit of Egerton’s to become a Kingsman (Kingswoman?) holds her own against the men. A standout is Mark Strong as their trainer. The various weapons, as in the Bond’s films, are a highlight but two low points are a vulgar, completely needless scene near the end involving Hanna Alstrom as a Swedish princess and a scene where a recruit has to choose between shooting a dog he/she have trained or becoming a Kingsman. The direction by Matthew Vaughn, and screenplay by Jane Goldman with Vaughn, is poorly edited and both are all over the place. The music is bombastic at times and at other times has nothing to do with the scene on the screen. Right now, in just the first 6 weeks of 2015, “Kingman” is vying with “Jupiter Descending” for worst picture of the year.